A compressor for all seasons at a price for all wallets. Absurdly flexible. Sounds great. Excellent value. To budget-conscious engineers in the know, Klanghelm's bargain-priced DC8C compressor has been a must-have since its initial release last year. V2 (a free update) expands the feature set, but here we're reviewing the whole thing as new. In Easy mode, DC8C 2 looks much like any other compressor, with the usual array of dynamics-shaping parameters on board: Threshold, Ratio, Attack, Release, Mix, etc. Just below the VU meter section, though, is a row of buttons that switch between four 'compression styles'. 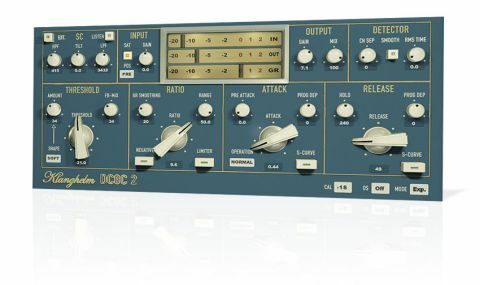 "Switch to Expert mode and a raft of extra controls are added to the interface, turning DC8C 2 into one of the most tweakable compressors we've seen"
These determine the character of the processing, ranging from utterly transparent (Smooth) to punchy and percussive (Punch), "transient-spitting" (Snap) and heavily distorted (Crush). The versatility that these four modes bring into play is impressive, and Easy mode in general is indeed very simple to negotiate. Switch to Expert mode and a raft of extra controls are added to the interface, turning DC8C 2 into one of the most tweakable compressors we've seen. The sidechain, for example, gets added to with frequency Tilt, and the RMS Time knob lets you set the 'rigidity' of input signal analysis anywhere between RMS and peak detection. In the Threshold section, the FB-Mix control sets the precise balance between feedback and feedforward behaviour, while the extended Ratio parameters include Gain Reduction Smoothing, Negative ratio mode and Range, which specifies the maximum gain reduction. The Attack and Release circuits are equally customisable, boasting adjustable pre- delay and variable program dependency. Being so absurdly flexible, it would be disappointing if DC8C 2 didn't sound great, but happily, we can report that it really does. Whether it's called on for transparent levelling, punchy character enhancement or brutal signal squishing, it constantly holds its own against plugins costing far more.